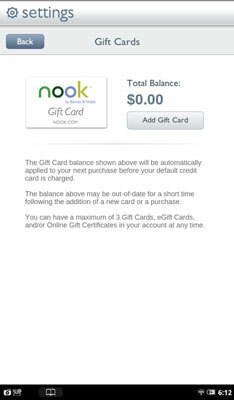 In order to purchase anything for your NOOK Tablet, you must have an account set up with the B&N store. This requires a username and password, as well as a credit card for purchases. Unless you say otherwise, your credit card is charged when you buy something from Barnes & Noble. It’s all done for you; there are no receipts to sign. Press the ∩¿ button to display the quick nav bar. In the App Settings section, tap Shop. Type the identifying number for the gift card (or other credit). Type the PIN from the card. You can register three gift cards, eGift cards, and online gift certificates at any one time. If you have more than that in your wallet, enter them after you’ve spent the others. When in doubt, call Barnes & Noble customer service for help. You can cancel a subscription anytime and get credit based on the number of remaining issues in the billing period. Go to the magazine’s offering page on BN.com to cancel the subscription. If you buy an individual copy of a magazine or newspaper, you own it. It stays on your NOOK or in your B&N account for as long as you’d like. However, if you subscribe, the tablet only holds on to a specific number of issues. The deletion of periodicals occurs automatically, whether you’ve read an issue or not. The oldest issue is deleted to make room for the newest. The number of issues your tablet keeps depends on how often issues come out. That is, unless you archive your periodicals. When you archive a periodical, it’s deleted from your tablet. You can always get it back, but you have to request it from deep storage.